When it came to Custom hubcaps in the early-mid 1940’s you did not to many choices. There was the full moon disk, the Single Bar Flipper hubcap, and there was the Swirl Hubcap. As far as we know this last hubcap was designed by George DuVall. 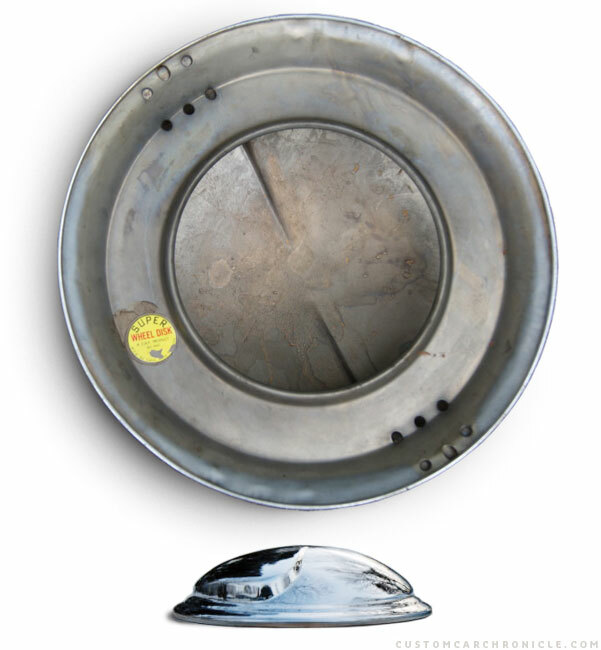 Lets take a closer look at this Custom Accessory Hubcap. 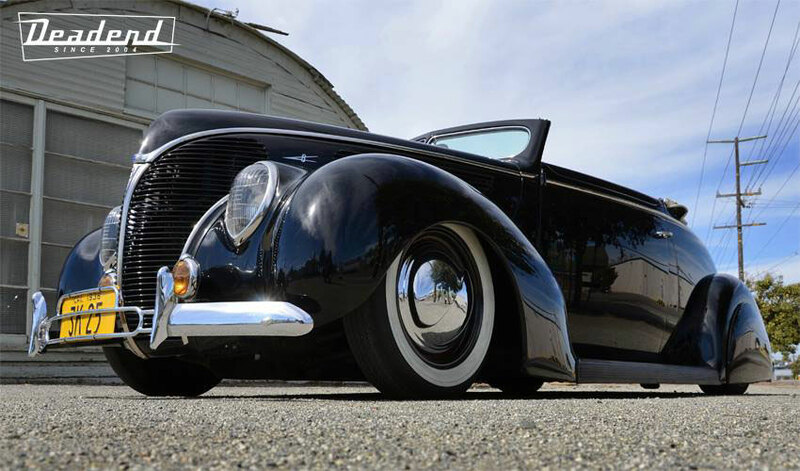 As with a lot of the early – 1930’s and 1940’s – Custom Accessory parts, there is not really any documentation on these parts. A few of these early parts, like for instance the Appleton Spotlights do have some printed documentation, and even some patent drawings to help date the products. 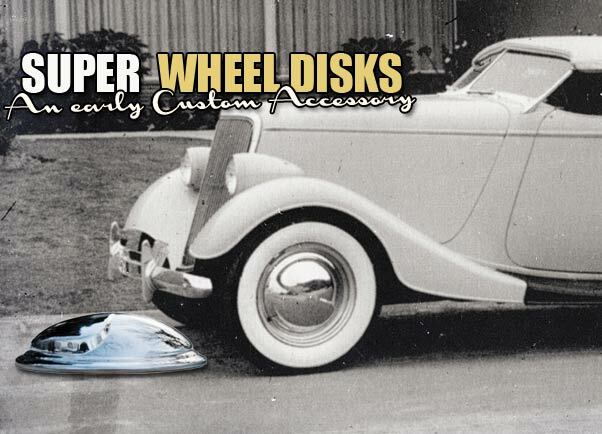 But for the hubcaps in this article, the Swirl flipper hubcap, or also called the Super Wheel Disks, we have not been able to find any documentation at all. Not even an advertisement or sales brochure where this hubcap was listed. Perhaps this printed material is out there, or at least some more information can be found. Hopefully this CCC-Article will lead to some more info on this early Custom accessory. We have heard from several sources that this particular hubcap might be based on a design by George DuVall. George is also credited with the Single Bar hubcap, the Custom Car hubcap with ripple disk and a single bar on its center. But for both we have no rock solid proof. 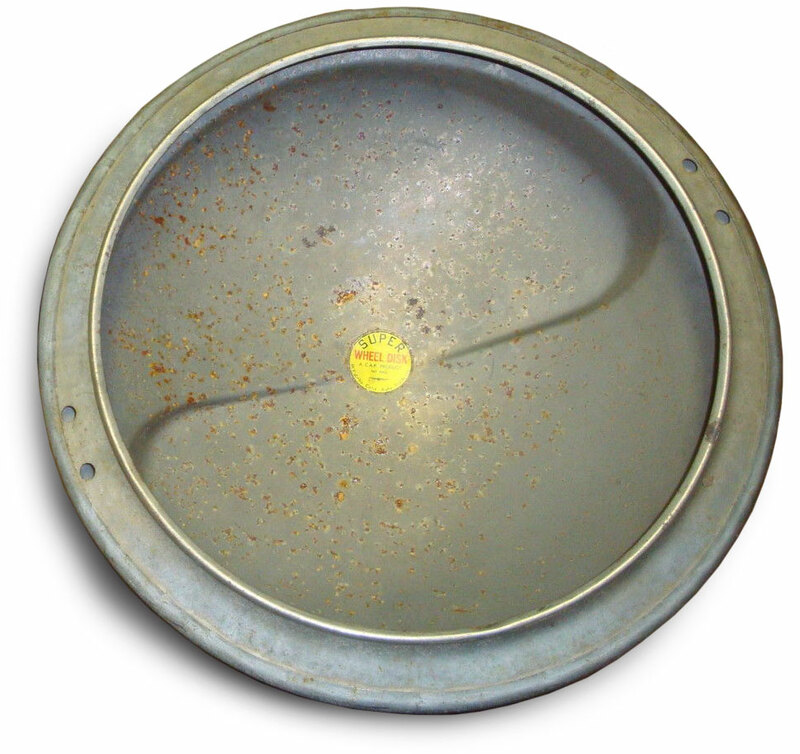 It is said that this Swirl stamped hubcap was designed after the Single Bar Flipper hubcap and shows a bit more streamlined design without the separate single bar flipper. This Swirl hubcap was used on some early Customs in and around WWII, but it never became a real popular item as the single bar flipper was. Which is really sad, since the hubcaps looks absolutely gorgeous in combination with a beauty ring on a wide white wall tired steel wheel. These Swirl hubcaps do show up at swap meets or on-line auction sites from time to time. And in several cases they were offered as NOS parts still in the original boxes. Another indication that these hubcaps were produced, but for some reason never sold in the amounts the producer and Speed Shops had expected them to do. The Swirl hubcaps we have seen were all produced by the California Auto Products company and made to fit 16″ wheels. 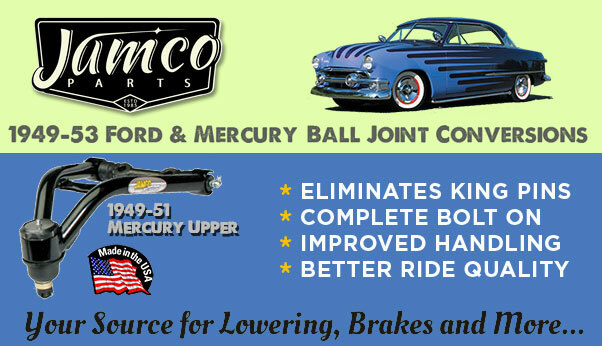 We have seen two different versions for two styles of 16″ wheels they would fit to. The California Auto Products Company was located at 113 West Ann Street in Los Angeles Ca. There are now modern office buildings on that address. 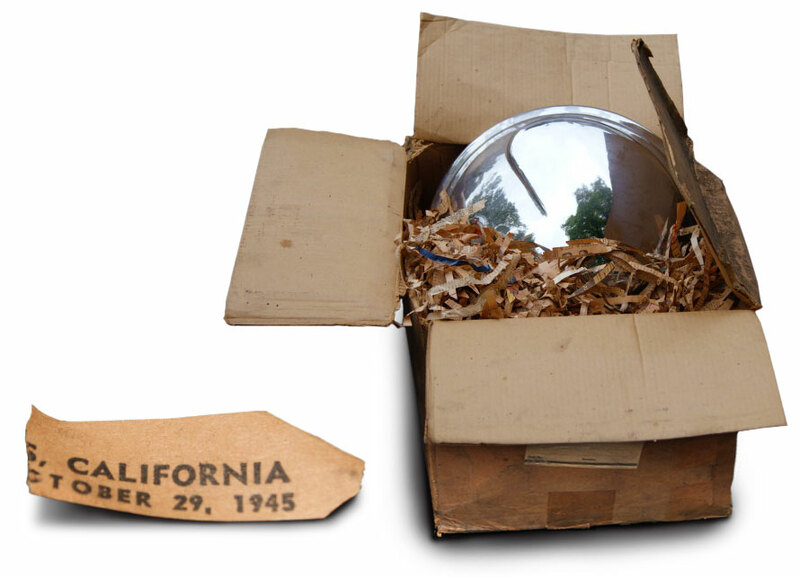 We do not know if the California Auto Products company commissioned George DuVall to design these hubcaps for them. Or perhaps the initiative came from George himself and that he was looking for a company to start producing his designs. 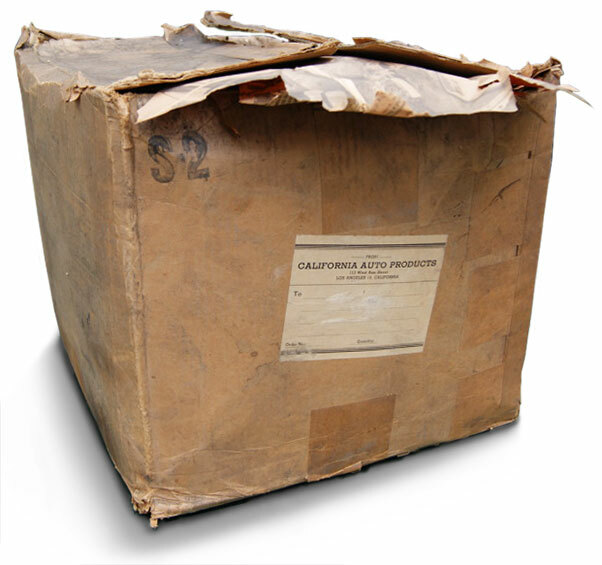 The box suffered some damage from being stored in a warehouse for many decades. 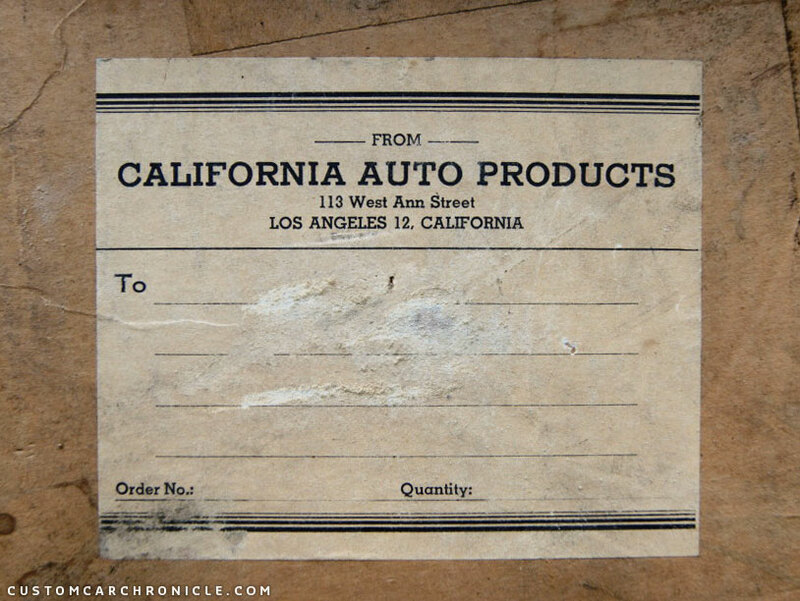 Shipping label from the California Auto Products in Los Angeles on the box. This set of four Swirl hubcaps was offered on eBay a few years ago. They came in the original box with cut down paper packaging material and had been in storage like this since the mid 1940’s. One of the paper cuttings in the box had the October 1945 date on it. This hubcap in this box was designed to fit 16″ GM wheels. 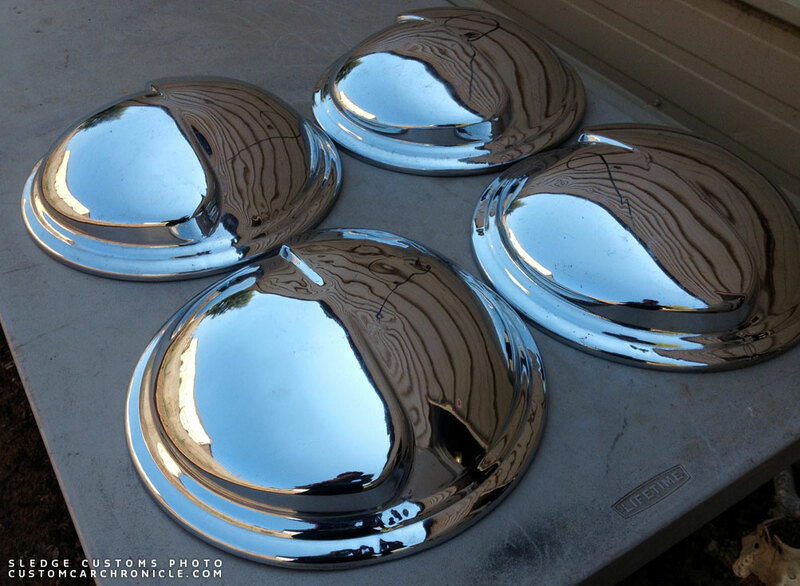 A set of four NOS Swirl hubcaps was found by Kevan Sledge of Sledge Customs in Auburn Ca. This set is also set up for 16″ GM wheels, but the hubcap backs can be easily modified to make sure the hubcaps will fit any kind of wheel. This photo taken by Kevan shows the nice soft “S”-shape pressed into the hubcaps. 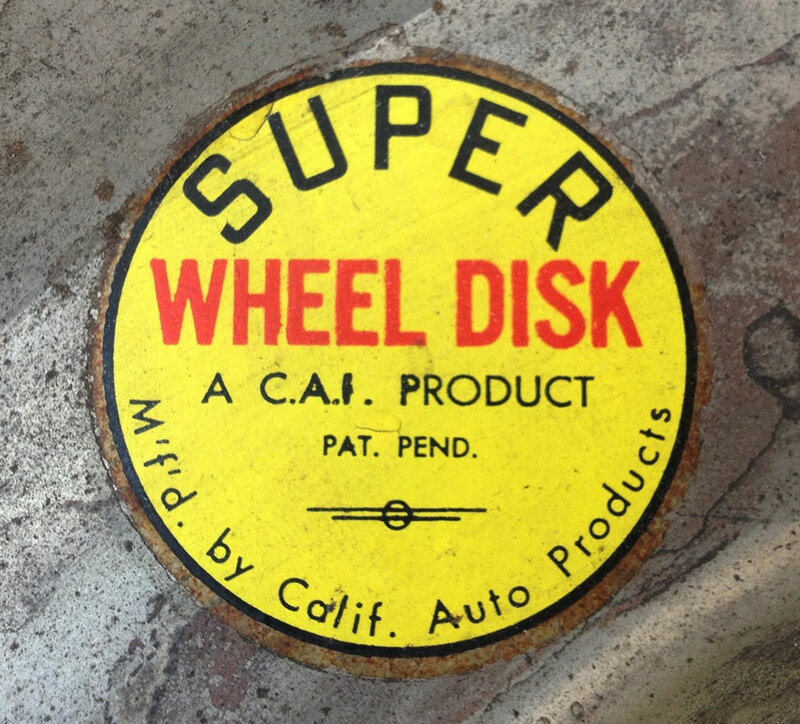 Super Wheel Disk sticker is added to each hubcap on the backside. Here is a different back side for the same swirl hubcap. This set was also offered on ebay some time ago and had most likely been used on a car at some point. It was clearly showing some patina. The side view of the hubcap gives us a nice look at the curved “S” shape. 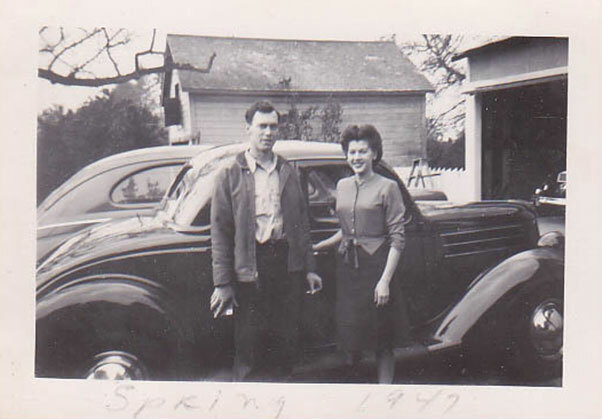 This photo dated Spring 1947 shows a 1936 Ford 5-window coupe with a set of Swirl hubcaps. 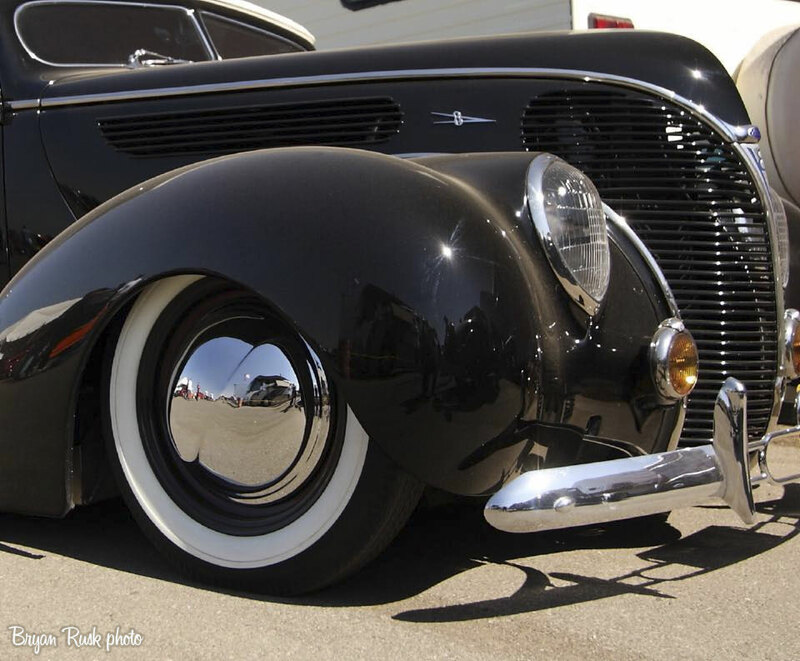 Bryan Rusk took this close up photo of the hubcap on Kent Kozera’s 1938 Ford. This photo shows how subtile and really beautiful this hubcap is. 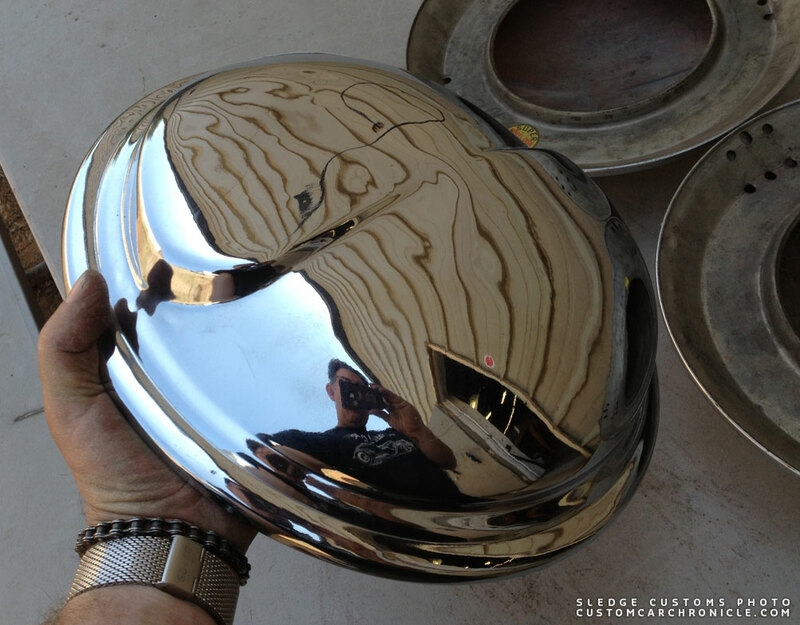 In this article we have shown everything we know about these Swirl hubcaps. This is far from a complete story, but we hope that with the help of this article we will be able to gather some more information about these Custom Car Accessories. So, if you have any more info about these hubcaps, when they were first made, designed, and where they were sold, or have perhaps more original photos from back in the day showing these hubcaps. Please email Rik with this info, so that we can add it to this article to further complete the history on this item. 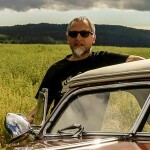 Stylish custom hubcap that looks like they are in motion standing still , streamline design at its best , thanks Rik for the article about one of the unusual and intresting custom car era parts ! The Rodder’s Journal,#36 did an article on the Du Vall /Kurtis-built SoCal Plating 35 Ford delivery truck, and Du Vall’s distinctive “V” windshield frames were covered in Rod & Custom, August, 1990. 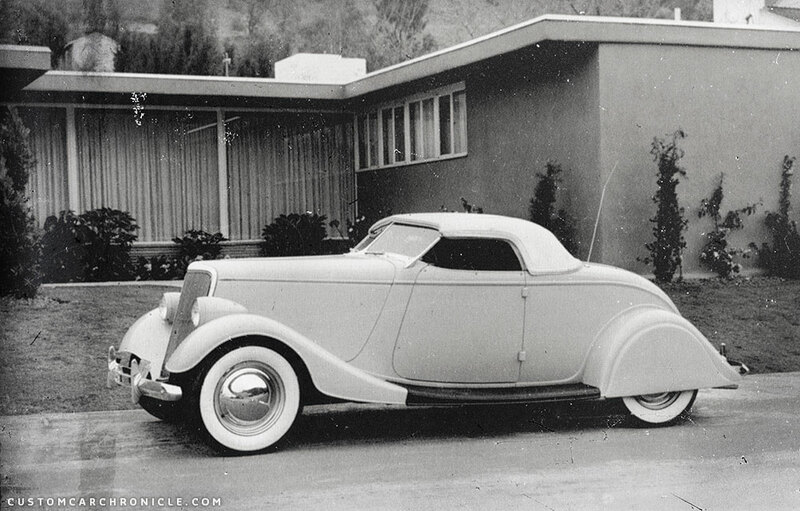 Then in The Rodder’s Journal #51, “The Enigma” article covered the Wes Coillins Du Vall windshield 34 Roadster, with these very Du Vall swirl hubcaps. A photo in that article, showing the hubcaps, cited its source as Trend Books #105, 1952. I’m certain this is the same white roadster as pictured above. Well, in 2013, these images popped up in my mind when I noticed a full set of four of these very hubcaps, up on a top shelf in Buzz and Jerry’s Rod Shop in the outskirts of Billings, Montana. Buzz was a good friend and very patient mentor to me, helping and guiding me in construction of my Diamond T. When he was diagnosed with terminal cancer, his partner Jerry LaFountain and I spelled each other off in care giving to our friend, while his wife Sandy worked during the days. It was at this time, reminiscing with Jerry in that shop that held so many pleasant memories, that I spied those hubcaps. Jerry told me he had obtained them in a trade with Ed Orser, a local legend among car collectors. Not sure now what Jerry had that Ed needed, but there they were, up on that top shelf. Ed is in his 80s, with Parkinson’s disease, but he might be able to give me the story behind how he obtained the swirl wheel discs. Sadly, our friend Buzz passed away just before Thanksgiving, 2013. Jerry LaFountain spends his winters in Arizona. But rest assured, I’ll approach him about those large (16″ ?) swirl hubcaps when he returns to northern climes. I’m certain he still has them. Correct Larry. The 34 Ford in the openings photo is Wes Collins’s Ford. Beautiful car. Looking forward to hear more about your story on those hubcaps. I called Jerry in Arizona. He won’t be back up to Montana til the 1st of May. He still has the swirl hubcaps, though. As I recall, they seem very large and deep, just as they appear in your images, Rik. Great article, Rik! I love seeing the original packaging of these things, and Wes Collins’ Ford is one of my favorites. Thanks for the article, Rik. The second cap appears to have a mounting flange for a ’36-39 Ford wide-5 wheel…not as common in my searches as the GM version and highly desirable nowadays. I have a set of Duvall’s that I modified to fit a ’40-48 Ford wheel that I’m running on my ’36.